The Van Diemen’s Land Pocket Almanack, for the Year of Our Lord MDCCCXXIV, being bissextile, or Leap Year; and the fifth of the Reign of His Most Gracious Majesty, King George the Fourth. Published under the Sanction and Patronage of His Honor the Lieutenant Governor, William Sorell, Esq. &c. &c. &c. Hobart Town: Compiled and printed by Andrew Bent, Government Printer. 96 p., demy 12mo in sixes (Wilson) pages 16.4 x 10 cm. approx. Plain blue covers with cream backstrip, some copies in marbled paper covers. 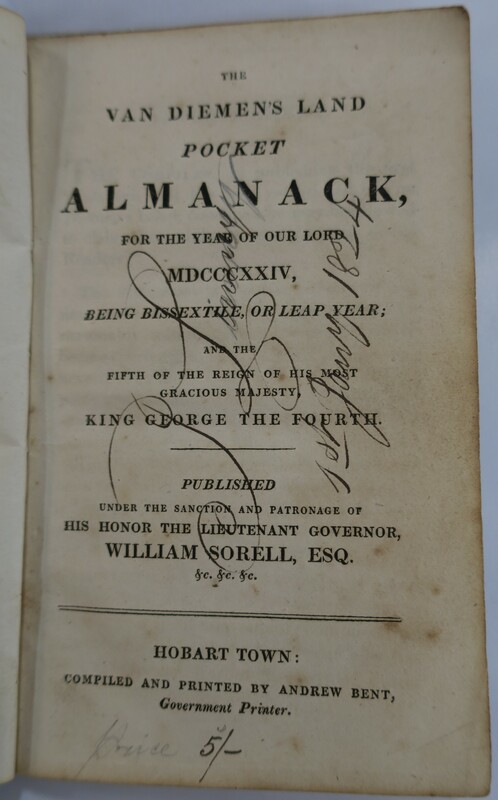 The Allport copy has been autographed by J. Linney on 1 Jan. 1824. Later in the year Linney returned to England with the volume in his luggage. Announced in HTG 14 May 1824: In the course of a few days this Charter will be published at the printing Office, in the shape of a Pamphlet. As only a few more Copies will be printed than the number subscribed for, those Persons who may wish to provide themselves with a Copy will be pleased to signify the same to the Publisher without delay. 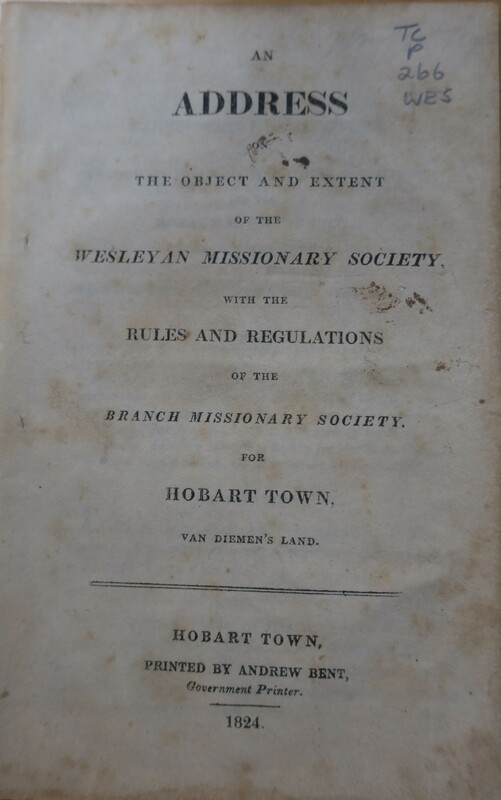 An Address on the Object and Extent of the Wesleyan Missionary Society, with the Rules and Regulations of the Branch Missionary Society, for Hobart Town, Van Diemen’s Land. Hobart Town: Printed by Andrew Bent, Government Printer. 1824. 8p., 19.5 x 12.5 cm. Printed on what Wilson describes as ‘rustic paper’ with watermark B/1821 over 3 possibly made in Sydney. The ‘Address of the Provisional Committee, stating the Nature and Object of Missionary Societies in general, and the Origin and Extent of the Wesleyan Missionary Society in particular’ was read at a meeting on 17 Nov. 17 1823 which resolved to have it printed (HTG 22 Nov. 1823). Bent was paid £8.15.0 for printing 300 copies. (Payment approved 5 Apr. 1824, voucher signed by Ralph Mansfield in TAHO NS499/1/155). On 19 Feb., the Sydney Gazette, having received what was obviously a complete copy, commented on its handsome typography, and made some extracts. TSL copy has only p. -6: Rules and Regulations [adopted at the meeting of 17 Nov.] and p.-8 Proceedings [of the same meeting]. There is no address. 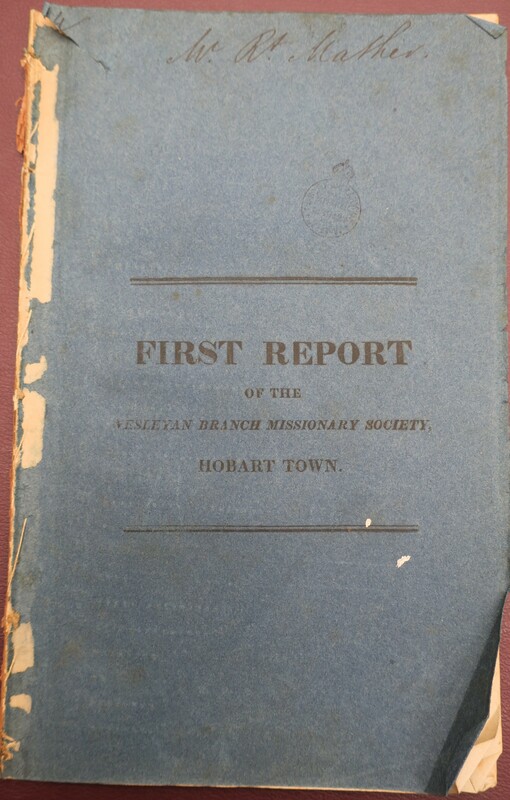 The first Report of the Wesleyan Branch Missionary Society of Hobart Town, Van Diemen’s Land. 1824. Hobart Town: Printed by A. Bent, Government Printer. 1824. 26p., 20.5 x 12 cm. Blue paper wrappers. Title printed on front cover with contents on cover verso. Publication announced in HTG on 17 Sep. 1824. On 14 Oct. the Sydney Gazette noted the receipt of a copy ‘which for excellence of typography cannot well be excelled’ adding that it was ‘a master-piece of composition, and seems to vie for ability with our last year’s Report of the Parent Society in this Colony.’ A payment voucher 31 Dec 1824 (approved 4 Apr. 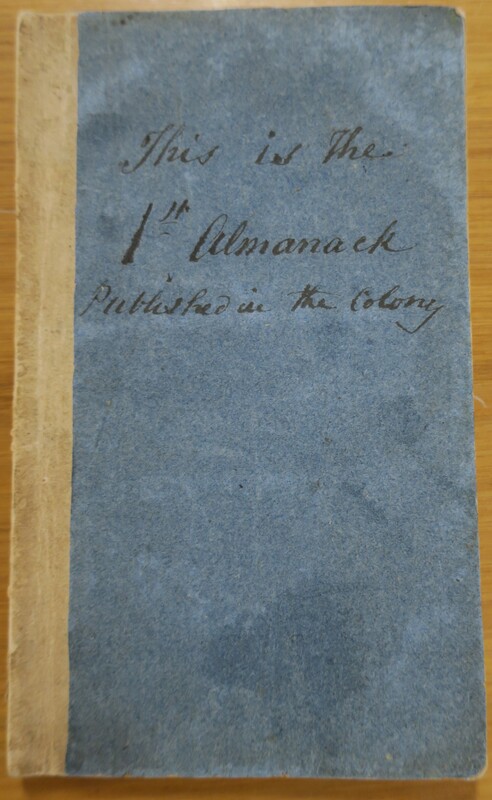 1825 and signed by Ralph Mansfield) indicates that 400 copies of this report were printed at a cost of £13.3.4 (TAHO NS499/1/115). 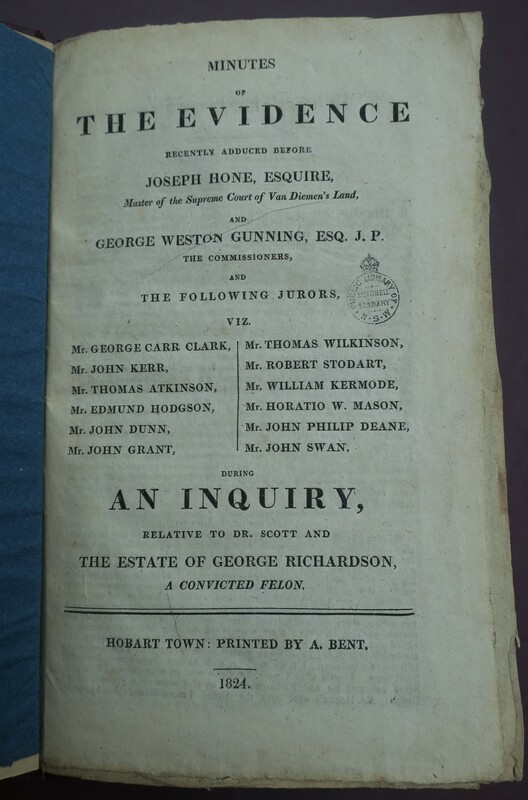 Minutes of the Evidence recently adduced before Joseph Hone Esquire, Master of the Supreme Court of Van Diemen’s Land and George Weston Gunning, Esq. J. P. the Commissioners, and the following Jurors [then follow 12 names] during an Inquiry relative to Dr. Scott and the Estate of George Richardson a convicted Felon. Hobart Town: Printed by A. Bent. 1824. George Richardson, convicted of sheep stealing, was executed in April 1823. The Commission of Information inquired into the manner in which his estate had been managed by James Scott, Colonial Surgeon, and what money was due to the crown. A verdict of £90 for the crown was given. Publication was announced in HTG 22 Oct 1824. Price 2s. 6d. Bent had originally intended to publish a ‘full, accurate, and impartial report’ of the proceedings in the Gazette, but announced on 15 Oct. that as it would have occupied nearly two pages it would be published in ‘a detached form, and at a price no more than equivalent to defray unavaoidable expenses.’ An account of the case, possibly copied from the pamphlet, appeared in the Australian on 9 Dec. 1824. An Act to Provide until the First Day of July, 1827, and until the End of the next Session of Parliament for the Better Administration of Justice in New South Wales and Van Diemen’s Land, and for the More Effectual Government Thereof; and for Other Purposes Relating Thereto. On 5 Nov. 1824 Bent notified his intention to ‘reprint’ this act (UK New South Wales Act 1823, 4 Geo. IV c. 96) due to public demand. Publication noted in HTG 19 Nov. 1824. By the third Report of the Wesleyan Hobart Town Sunday School Union, presented to the General Meeting on the 7th of last June, and just now published, we learn with profound regret, that during part of the last year the Town School was reduced to a very low ebb.